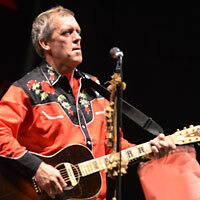 I admit I had my doubts when I heard that Hugh Laurie, the British actor who for eight seasons played the drug-addicted doctor on TV’s “House,” was to perform at last weekend’s Rhythm & Roots Music Festival in Charlestown, R.I. But Laurie, fed by his highly skilled and vivacious Copper Bottom Band, was indeed a crowd-pleaser. Though Laurie, touring for the debut of his new CD “Let Them Talk,” turned out to be a decent interpreter of American blues, people were clearly drawn to his performance by the novelty of seeing a TV star. As I sat in the audience snapping photos and a few videos, many shouted out disease names that they had heard on the TV show. What can you expect? 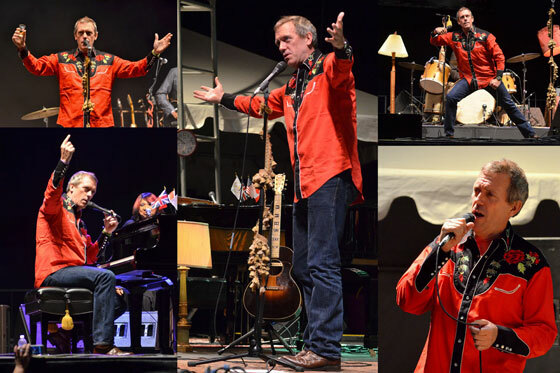 Laurie, wearing a bright red Nudie-style rodeo shirt, endeared himself immediately to the crowd, walking on stage without being announced, holding up a shot glass of something, and saying: “As a young man growing up in England, I never dreamed I’d be saying these five words, ‘Good evening, Charlestown, Rhode Island. '” He continued, “I thank you and salute you as the first of the 13 colonies to shake off the shackles of King George and the hated Redcoats, which I only just remembered when I put this shirt on.” Cue the whoops and hollers of an adoring crowd. Laurie proceeded to play a solid set of blues on guitar and mostly piano, with stellar backup and leads from his band. His banter was sincere in his appreciation for American blues, and he was animated and energetic on stage. In short, he was a decent performer, and his joy in performing came across well. Oh, and he eventually finished his shot.